This lighthouse has a special inverted glass dome light fixture with wire cage to add an authentic look and accepts up to 100 watt bulbs. Made primarily from three quarter inch pine. Measures 71"H. Hardware-Lighting kit and optional copper roof kit available separately. 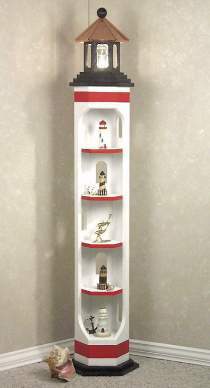 Lighthouse Display Lamp Hardware Parts/Lighting Pkg. Includes inverted glass dome light fixture, 8 foot cord set, in-line cord switch, roof ball and wood roof dowels. Project plan, light bulb, wood and paint are not included.